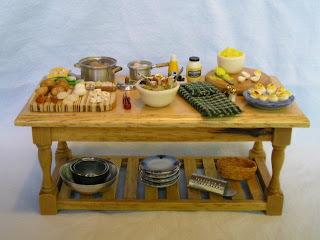 I have been a miniature artisan for over 30 years. 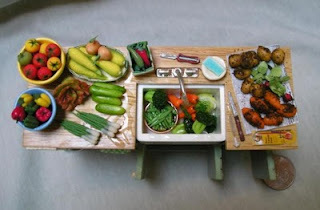 My main specialty is creating 1/12 scale food with polymer clay. I also create flowers and prep table scenes. I have dabbled in creating all aspects of miniatures with the exception of knitting & sewing. I suppose you can say I am a jack of most trades in miniature. I feel if it's life sized, then I can create it in miniature. My buiness doesn't have a name per se...just Debbe Mize Miniatures.